We are in the automotive business since 1980. We are confident that our car servicing prices can’t be beaten. 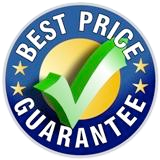 We will MATCH or BEAT any genuine competitor’s advertised price on the date of your car service. We even MATCH competitors sale prices! Check out our price list below and book your car service today! was €75DO IT MONTHLYBook Now! was €225DO IT EVERY 12 000 MILESBook Now! was 399NOTHING GOES UNCHECKEDBook Now! How often should car be serviced? As a rule of thumb, vehicles should be serviced (full service/Gold service) at least once a year and/or every 12,000 miles. For specifics, please consult your vehicle owners manual. If your vehicle does more than average mileage, more often checks are recommended! Do you provide oil, filters etc? If your car needs additional parts, once we have your approval to replace them, we can source them in no time. Do you provide replacement vehicle? Yes we can provide a courtesy vehicle when your vehicle is getting a Platinum car service or in the unlikely event that long delays on our part arise. How long does it take to service my car? We can have your car serviced in as quick as 20 minutes* depending on the service type you choose. **for platinum car service please allow time needed to collect and deliver the vehicle. Can I provide my own oil and filters? Yes you can provide your own oil, filters, etc. The cost of the service will be adjusted accordingly. Is car service booking, a must? For a swift customer service, we recommend that you book your car service 24-48 hours in advance. If you have no booking we will do our best to service your car ASAP. You only pay the price listed on this site. There are NO additional charges, taxes or premiums. In the event that your vehicle need additional parts and/or repairs we will NOT proceed without your approval!